Hurricane Michael made landfall yesterday near Mexico Beach, Florida as a very powerful category 4 storm. It is the strongest storm to make US landfall since Hurricane Andrew in 1992, and it is the strongest October hurricane ever recorded. The past wind swath shows the range of the hurricane force winds (the middle band shown above), from landfall in Florida and extending inland into Georgia. The post-event impact summary report template is now available within EigenPrism. Tropical Storm Michael made landfall at Mexico Beach, Florida close to 1:30 pm EST yesterday as a very strong CAT 4 storm (2 mph short of a CAT 5). Hurricane Matthew strengthened into landfall, reaching a low pressure of 919 Mb, third lowest recorded in the US … the highest official wind gust is 129 mph (Tyndall AFB), which received a direct eye-wall passage. Tropical Storm Michael is moving quickly to the northeast today across the Carolinas and will maintain a minimal TS strength, but the system is becoming extra-tropical quite quickly. The rapid movement of the system will limit flooding rain, but some areas across the Carolinas and Virginia will see between four inches and six inches and locally more across the Virginia Blue Ridge. From landfall near Panama City to the right of the storm, significant storm surge occurred with Hurricane Michael. 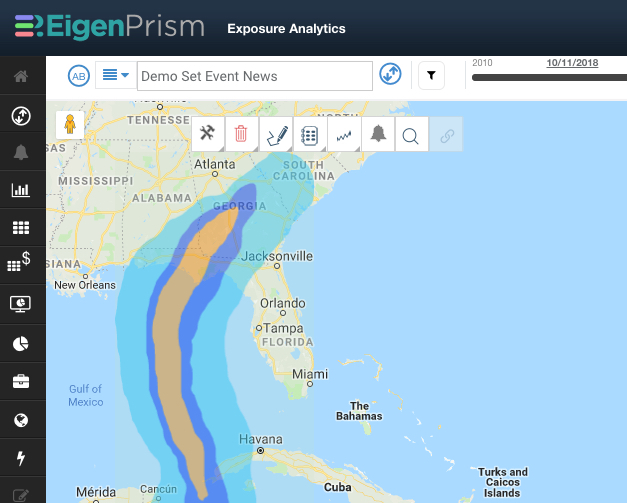 A post-event impact summary report template for Hurricane Michael has been provided to EigenPrism subscribers, containing data sets to help assess potential damage, including wind, precipitation based flood and potential storm surge. Please just click here to email us if you need help setting Alerts, or with further event analysis.